Fancy a journey into space? Starting in 2009, you can take a space trip with Virgin Galactic for the bargain price of $200,000! Virgin Galactic bills itself as "the world's first spaceline" and will offer flights beginning in 2009, if all goes well. Flights, which can be booked for a $20,000 deposit, will take you more than 80 miles above the Earth. You'll experience 6 minutes of weightlessness and then come hurtling back to the ground in SpaceShipTwo. "What you get for your $200,000 includes three days of pre-flight preparation, bonding and training onsite at the spaceport. The big day arrives with departure of the White Knight Two that cradles SpaceShipTwo, hauling the vehicle and passengers to 50,000 feet in altitude for release. Space travelers will then be rocketed to around 360,000 feet in altitude, some 68 miles high, with 'free-floating' passengers experiencing 4 to 5 minutes of microgravity. Faces pressed against large windows, customers get an on-high view of more than 1,000 miles in any direction. As for the length of time for SpaceShipTwo to glide to a terra firma touchdown, that takes some 30 minutes. The suborbital journey ends with SpaceShipTwo gliding to a runway landing. All-in-all, the suborbital sojourn - from takeoff to touchdown - takes approximately 2.5 hours." If you book and fly early, you're likely to share the cabin with celebrities like Paris Hilton, Dave Navarro, and Moby. Admittedly, this is a likely downside. The commercial spaceliners will be built by Scaled Composites, a company owned by Burt Rutan, winner of the Ansari X prize competition. 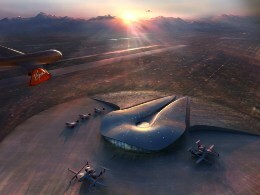 Flights taking off from New Mexico's Spaceport America located in the Mojave Desert can be booked from the Virgin Galactic website. Work has begun on the spaceport, and the large facility will be your base for a holiday that's literally out of this world. Last updated by jack on 12 December, 2014 in Travel.